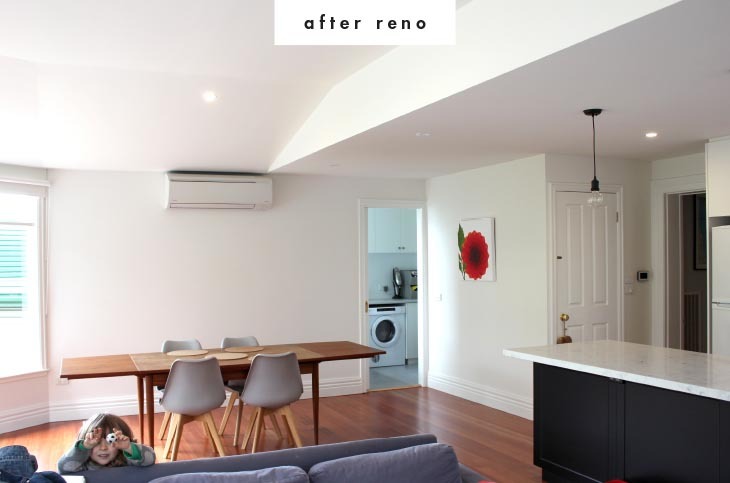 Today l wanted to show you before & after pics of our laundry renovation, plus share some organising ideas. 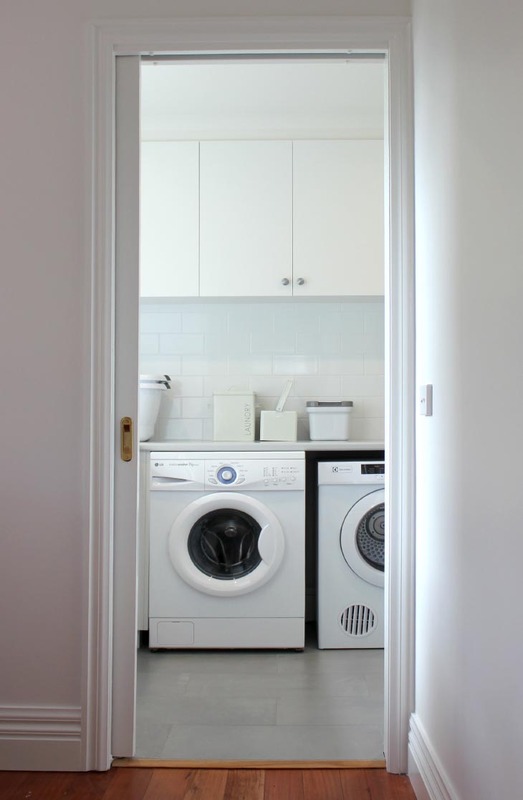 Creating a separate laundry was on top of my ‘home renovation wish-list’ (insert heart/happy face emoji!). 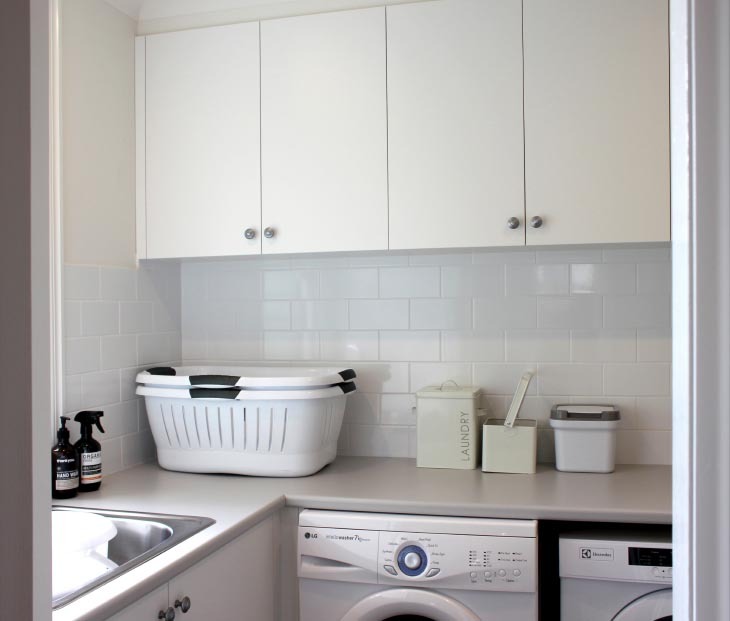 I wanted to create a practical space to wash and fold clothes, store cleaning essentials and other household items. We didn’t have a huge space to work with but l think the result works… simple and practical, with just enough storage space. Above: Before & after pics, with our little girl Jessie doing a photo bomb! Originally this space included a separate toilet and bathroom, this was positioned off the dining/living room. 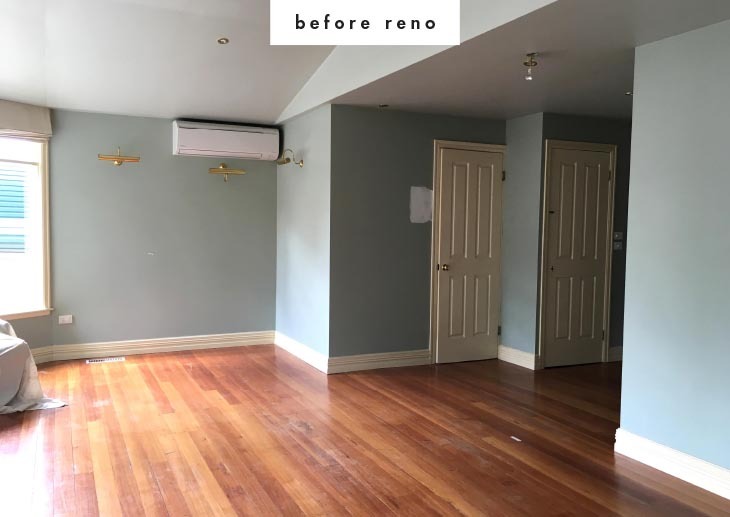 The toilet encroached on the dining room space so we decided to knock these walls out and replace the small bathroom with the laundry. It made more sense for the laundry to be within reach, so l could pop on washing while cooking the dinner! Top priority on the laundry reno plans was to maximise storage space. Our place is an old Victorian home, so there’s not a lot! 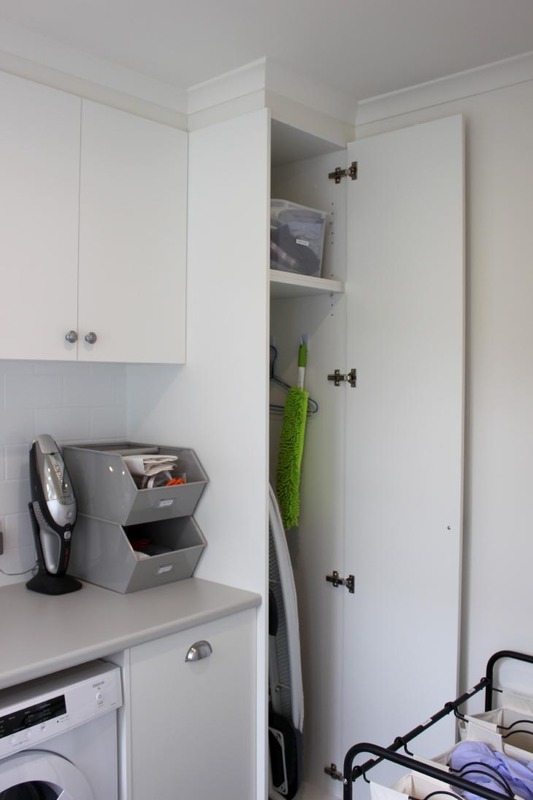 We decided to go with overhead cupboards (for storing all the essentials), a long bench (to fold clothes) and a tall cupboard (for storing long items, like the ironing board). What l store where, is forever changing, it just depends on what works best at the moment. Currently the ironing board and ironing basket (mine is a rising box) is stored in the tall cupboard. I have installed some hooks here too for hanging clothes hangers, duster, etc. I’m a big fan of my clothes washing basket. It has three bags for separating out whites, darks and coloured clothes. One bag equals one wash, so as soon one is full l do a load of washing. TIPS: 1. I recommend storing items in logical spots, e.g. l keep my washing powder directly above the washing machine. 2. Keep items, like a handheld vacuum, plugged in and charged, so it’s ready to go when you need it! Above is the first overhead cupboard. I like to keep all my medicine and first aid items here and within reach for adults but not for children! The top shelf has other household essentials, light globes, etc. TIP: 1. 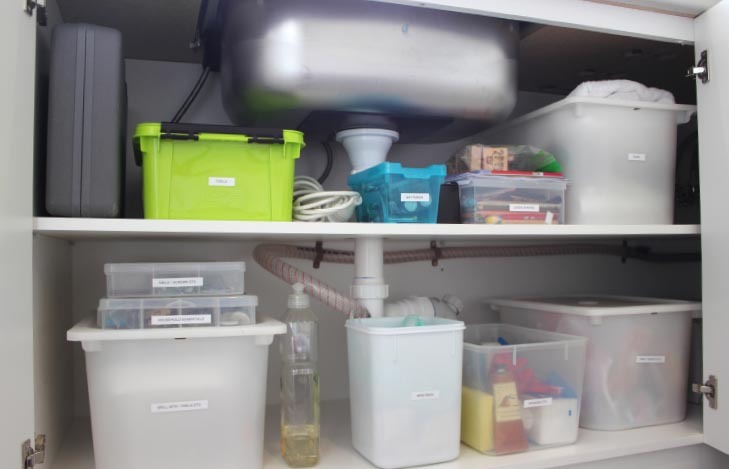 Store ‘like’ items together and label storage containers to let family/household members know where items are. 2. Store adult and kids’ medicine separately. Making it easy to find items when needed! Above is the middle cupboard, storing other essentials, e.g. cleaning product, table cloths, table candles, napkins, drink coasters. Perfect spot as the laundry is situated directly off the dining room. I like to store any smaller ‘like’ items together in a larger storage container, especially if they are stored on a higher shelf. 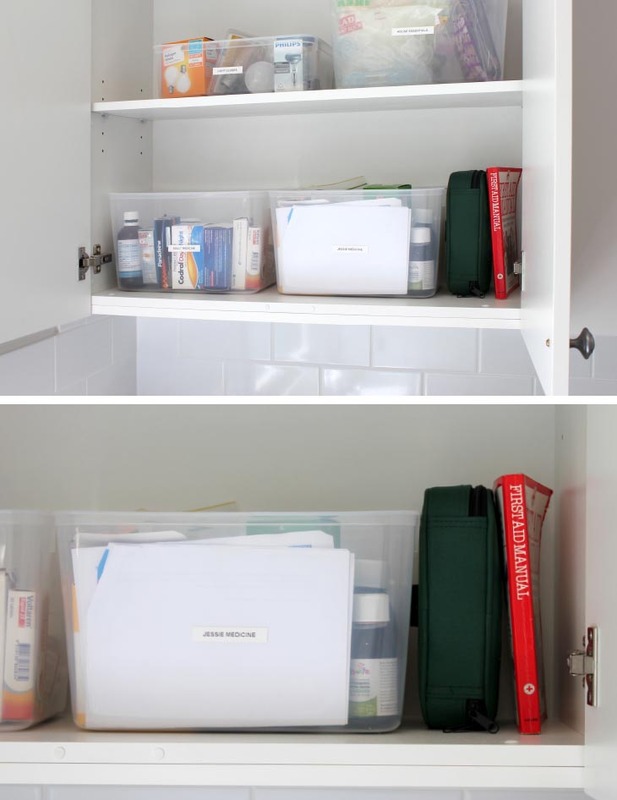 It makes it so much easier to keep organised and get down. 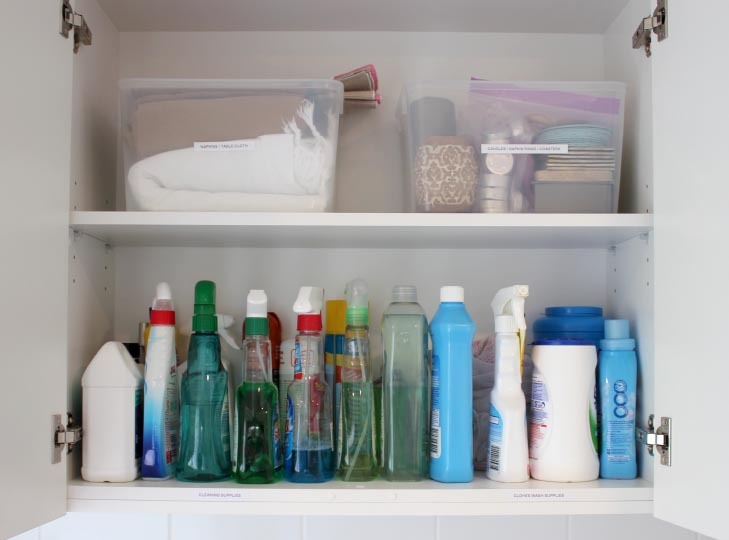 TIP: Store a backup of your household essentials, e.g. 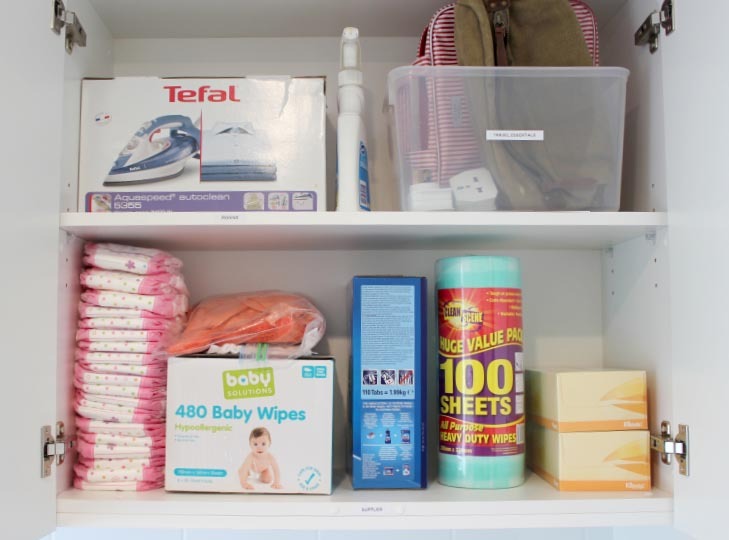 spare box of tissues, washing powder, baby wipes, etc. So you never get caught out! Under the sink l store other essential items, like essential tools, rags, spare extension cord, etc. All those essential bits and pieces you need in your house rather than the garage! 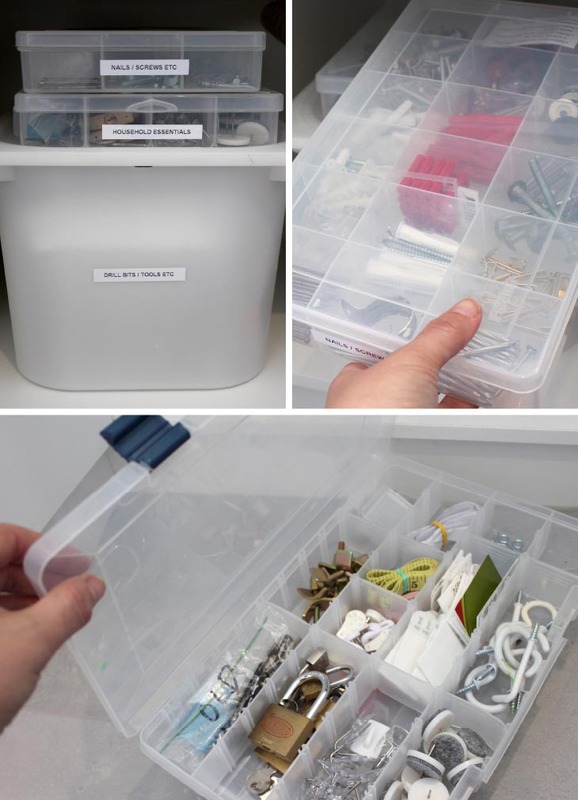 + BigW compartment storage containers for storing smaller items. 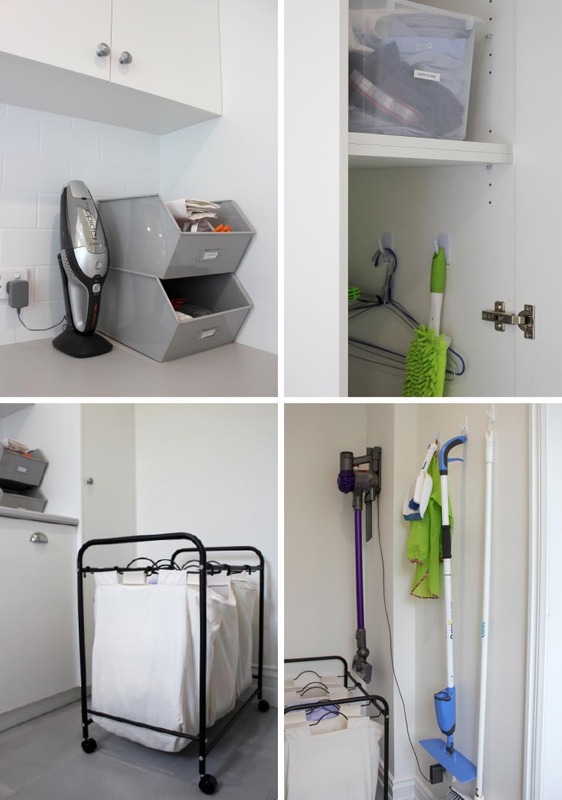 + Command hooks for hanging brooms, etc. Practical and easy to remove when you need to. + Love my Kmart three compartment laundry basket. This one is no longer available. See Temple and Webster for alternative. Product images via store websites. Product links shown above. Welcome to my blog, Declutterhome. love of organising. Hope you enjoy!